Fire Summary: Fire activity was moderate yesterday. The most active part of the fire was the southeast corner near Mountain Aire and Rogers Camp, although the fire did not grow significantly. The fire is east of Bateman Ridge down in the Wilson Creek drainage. The fire perimeter and control lines around Sequoia Crest and Wishon are holding. Fire managers feel confident that the lines will hold the fire west and south of those communities. On the northwest side of the fire, crews hiked in to mop up firelines. Some portions of the fire’s edge are inaccessible by ground crews. Aerial observers will monitor them for several days. Around three o’clock yesterday afternoon, firefighters initiated firing operations on the southwest side near Upper Rio Vista, working southward toward Cow Mountain. Most of the smoke and increase in acreage today was due to this successful firing operation. As a result, Tulare County Sheriff’s Office downgraded the evacuation status of Springville and the surrounding communities (see below). Fire crews will be patrolling and monitoring the firelines tonight. Evacuations (modified): Tulare County has two levels of evacuations: voluntary and mandatory. A voluntary evacuation means residents should either evacuate or be prepared to do so, should fire conditions worsen. Mandatory evacuations are issued when the fire poses an imminent threat to life and property. Evacuation Center: Porterville College Student Center, 100 E. College Ave., Porterville. Call 661-324-6427 (weekdays) or 800-REDCROSS (1-800-733-2767). Light winds and stagnant air flow moderated the intensity of surface fire in the higher elevations. Isolated pockets of fuel were seen smoldering throughout the day at lower elevations. Rollout diminished along steep terrain as fuels are consuming completely. The Voluntary Evacuation Order has been rescinded for the community of Ponderosa. 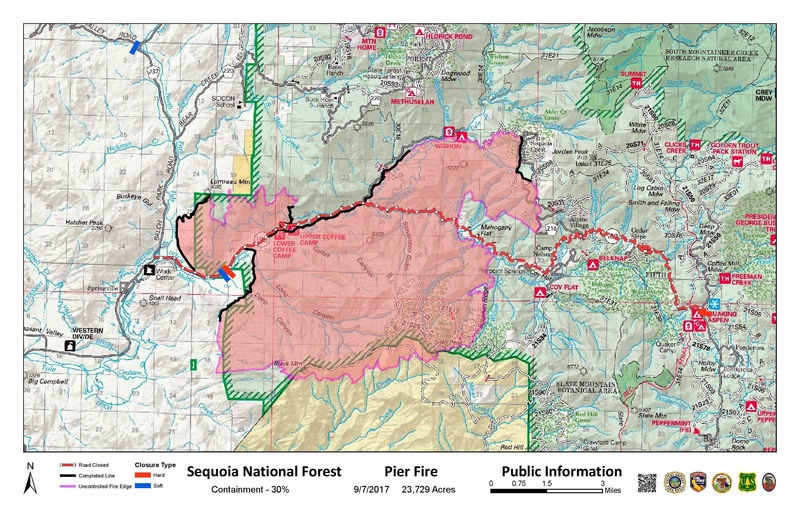 This entry was posted in fire, Fire Brigade, ponderosa, Uncategorized and tagged back burn, black mountain, cal fire, california fire, containment, fire, fire safety, pier fire, ponderosa, Springville, wild land fire. Bookmark the permalink.